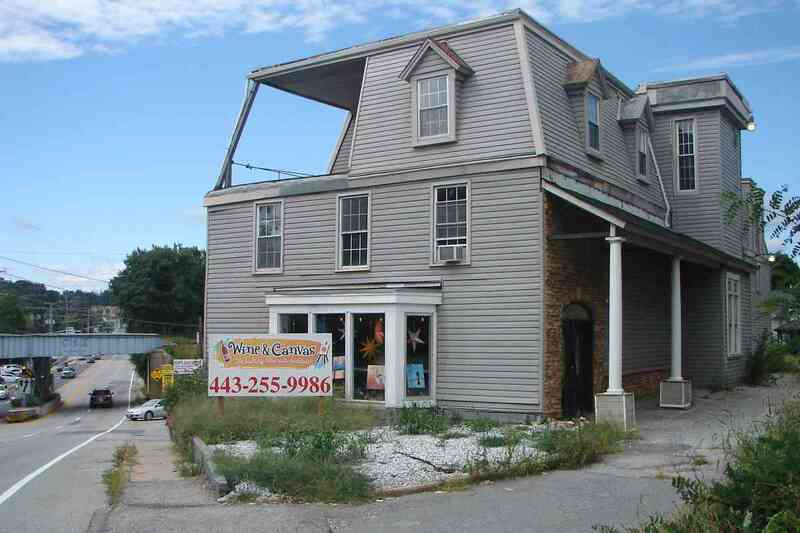 Land development continues to drop off the farther we proceed from Baltimore City. 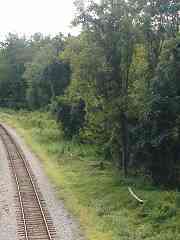 From this high point at Sudbrook -- note the spring water at right -- the railroad turns to resume following the Gwynns Falls valley upstream. Milepost 10 is easier to find in this photo. Church Lane's other direction is less treed, plus less leafed during early sping. This is the subdivision's only masonry bridge one can drive under, at least between Port Covington and Owings Mills. 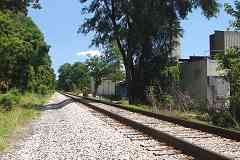 Just west of Church Lane a siding diverged to serve trackside businesses. The previous photo had likely been snapped from a window or the roof of one of these buildings. The siding has been dismantled since. Looking the other way we see a bridge, wait, a couple of bridges coming soon, the nearest is for Old Court Road. 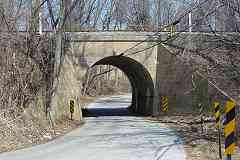 The WM's grade crossing with Old Court Road was eliminated in 1932 upon the opening of this underpass. Realigning Old Court Road to match (red lines) would come later. 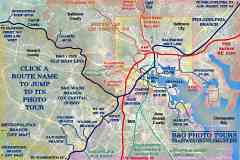 The I-695 Baltimore Beltway also came later, just off the top left corner of this photo, as well as Metro's Old Court Station, just off the bottom left corner. 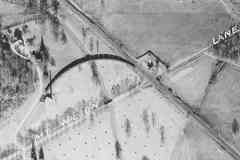 "If you look at the upper left I believe it shows the original track alignment prior to the construction of Sudbrook Park. I was told this by someone when I was young so I don�t know how true it is. It does make sense since Greenwood Road which occupies this area now is strangely straight and flat then turning into an S curve as it enters Sudbrook Park. I think if this was constructed as a road they would have eliminated this S curve. 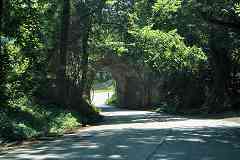 Greenwood Road was used by the local kids as a drag strip due to it being long and flat. The County frowning on this activity placed a stop sign where Church Lane enters Greenwood and purposely never resurfaced the road which turned it into a car integrity test if you tried to drag race on it." 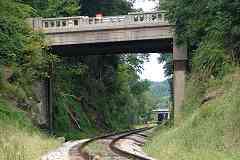 In 1967 Old Court Road was straightened and widened, requiring this longer bridge that remains on duty. The name "Old Court Road" implies obviation by a newer "Court Road" but that is not the case. Instead "old" refers to the age of the road, which predates European colonization of this region. 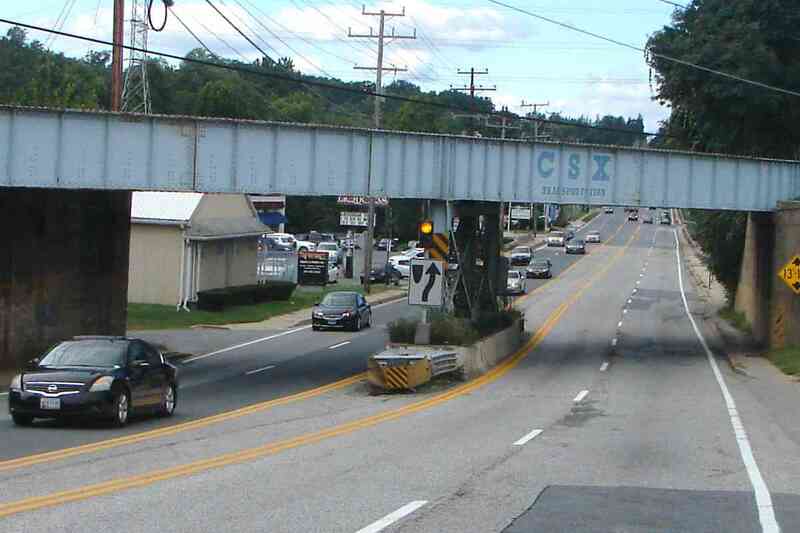 WM 54 lead a mix of freight and coal through Pikesville. I am uncertain of the direction of view. 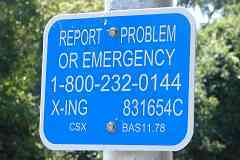 The signal's number appears to be 108, which corresponds to milepost 10.8. 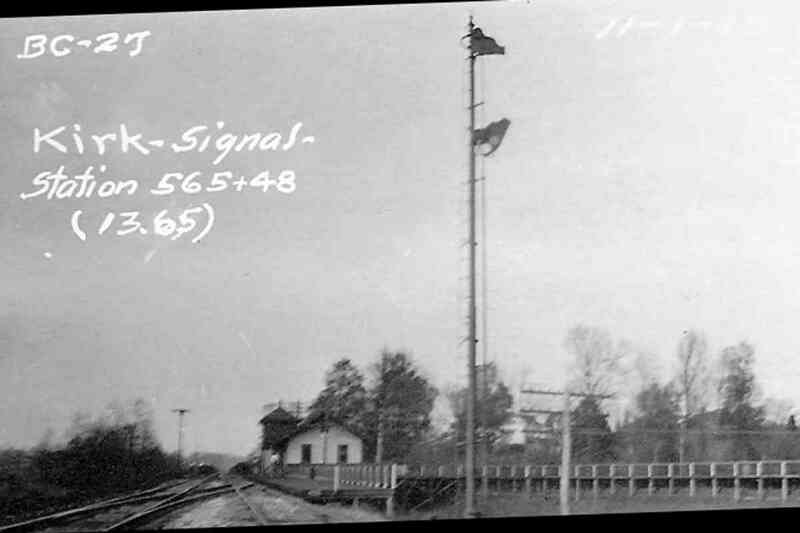 The digit 8, an even number, normally means this signal controls eastbound traffic, which means we're looking east while the approaching train heads west. However the angle of summer sunlight matches that of the photo below which suggests we're looking west. 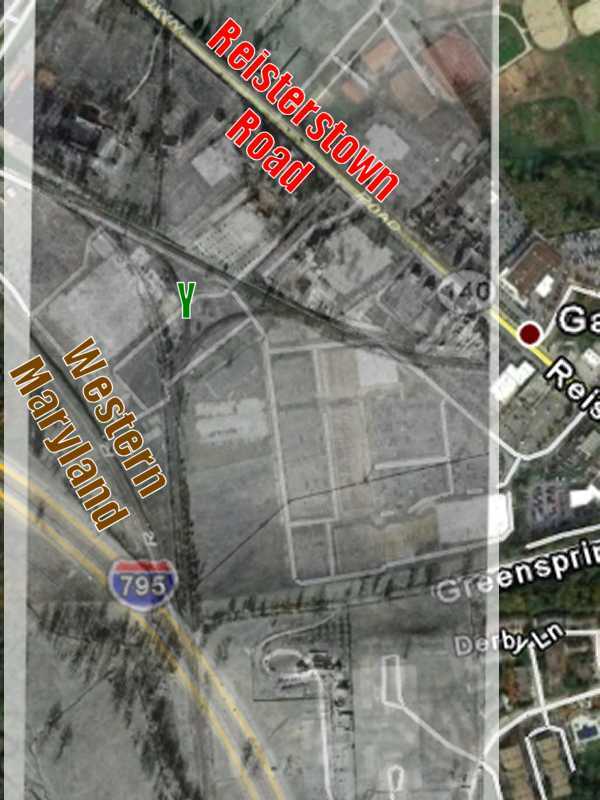 This is a modern view near the location of the prior photo, as well as after the Baltimore Beltway arrived. Clearly this area suffers from such a serious canvas shortage locals must resort to painting concrete expanses few others will ever see. The concrete walls are angled in a manner I have not observed elsewhere. 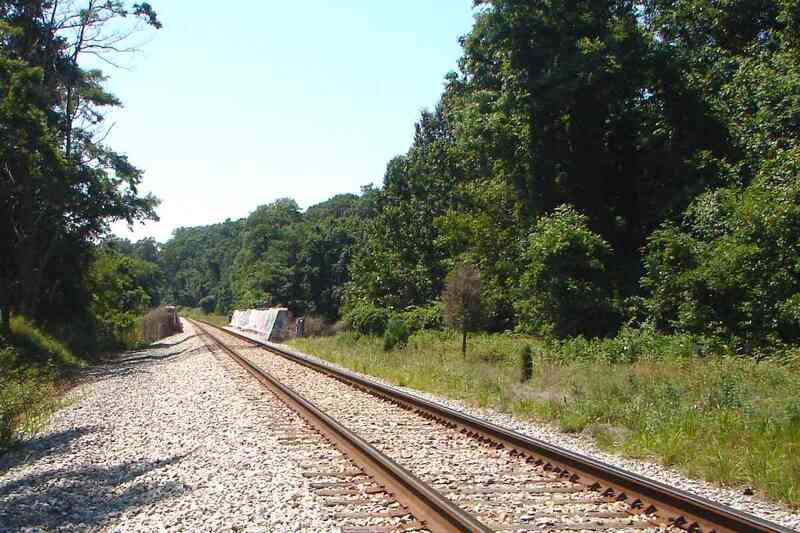 At almost 250 feet, this is the longest active bridge on the line within Maryland. It spans 11 lanes of Beltway traffic. 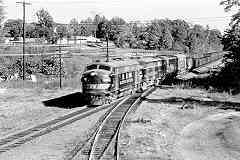 "Somewhere around the Beltway area was once a park that the railroad built for summer excursions. The same guy that told me about Greenwood Road told me this. 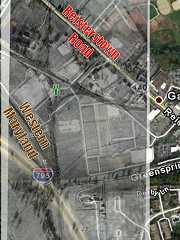 I think was probably located were the Beltway it located. I looked one time but could find nothing in the area. 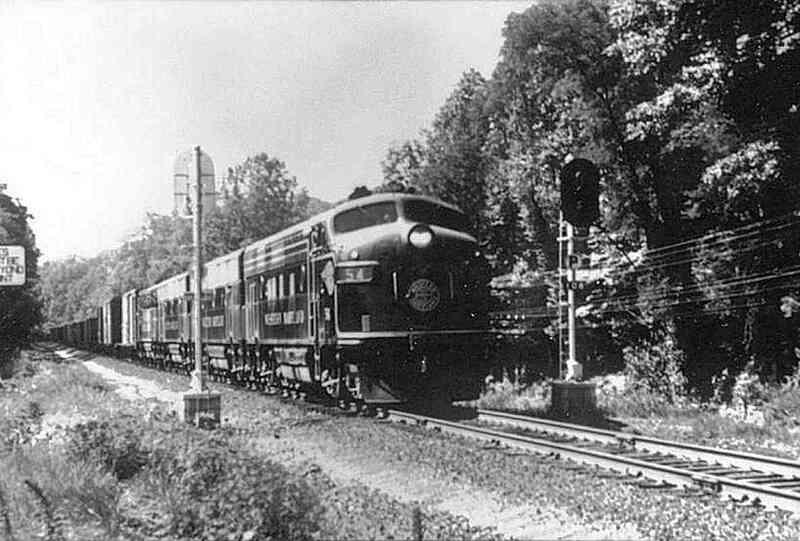 There is a mention of it in the book that the railway wrote commemorating their 100th anniversary saying it was closed when they opened the Park at PenMar." This view of the WM bridge over I-695 is more familiar. 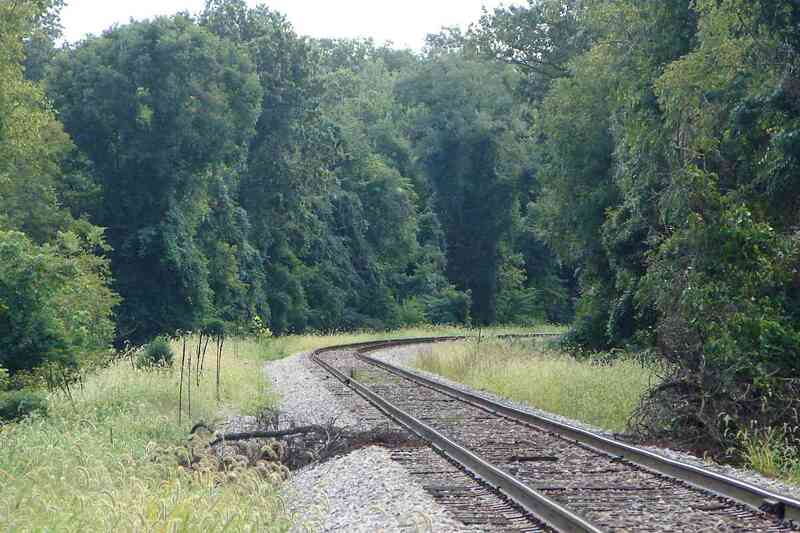 A few trains per day use this route but I've never caught one while driving on the Beltway. 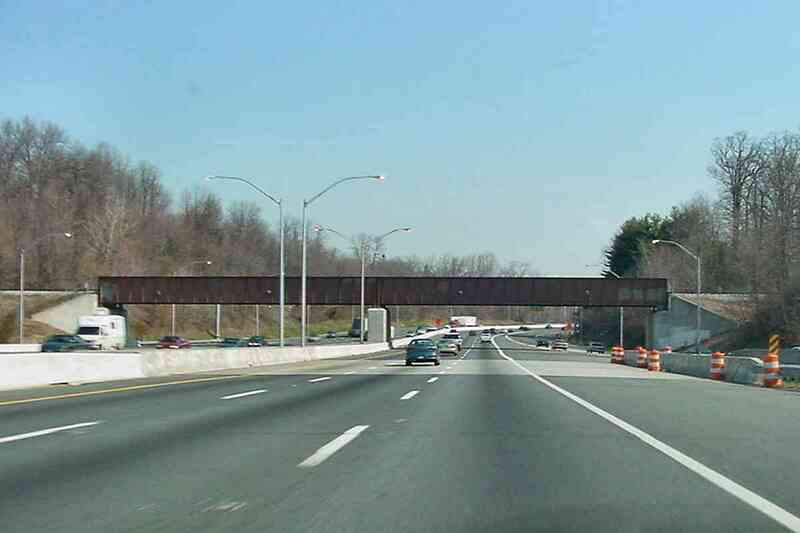 The bridge is long enough to span entrance lanes from I-795 on the right. I-795 did not open until 1987, decades after I-695. 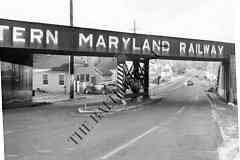 Was the railroad bridge built long enough to permit the future I-795, or was it extended during the 1980s? I have not found an aerial photo that can answer. 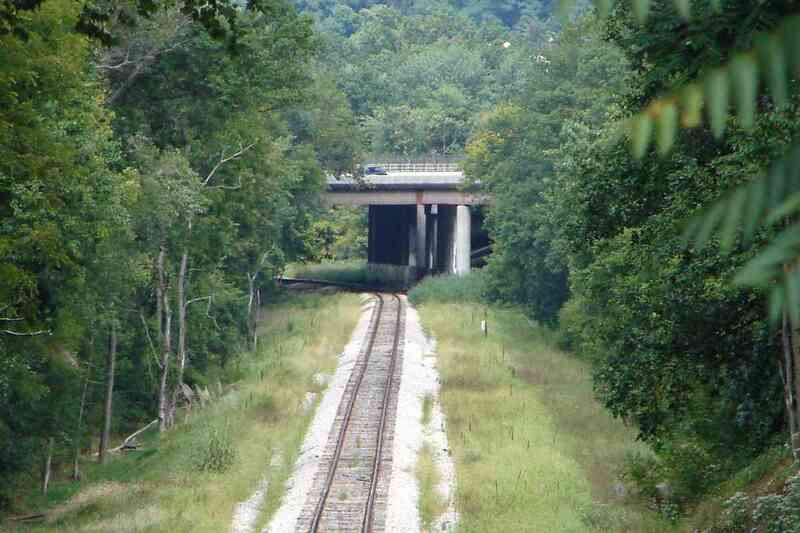 "When I-795 was being built, they built this new railroad bridge next to the old one. 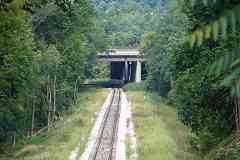 The old bridge looked very similar and was painted black with Western Maryland Railway painted on the sides. It was removed after the new was opened." 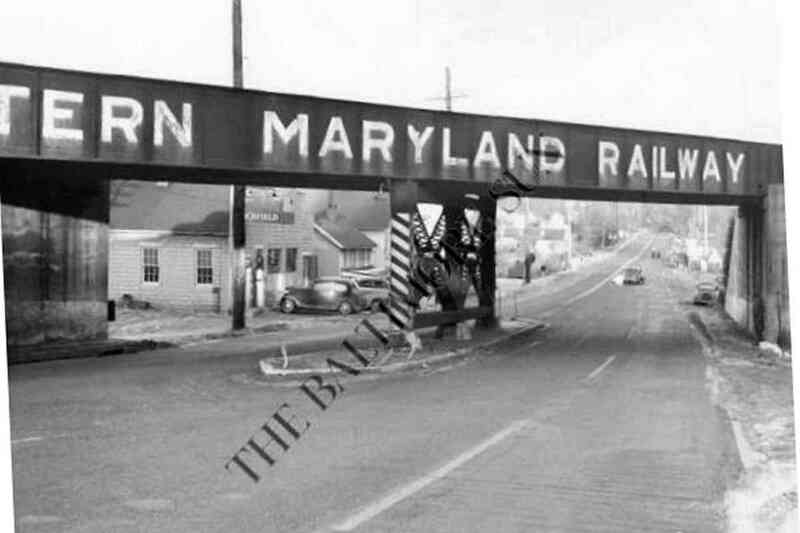 "I remember when that section of the beltway was opened in the early 1960s. The WM bridge that originally spanned the highway was only long enough for the 2 travel lanes in each direction, shoulder on each side, plus center grass median. 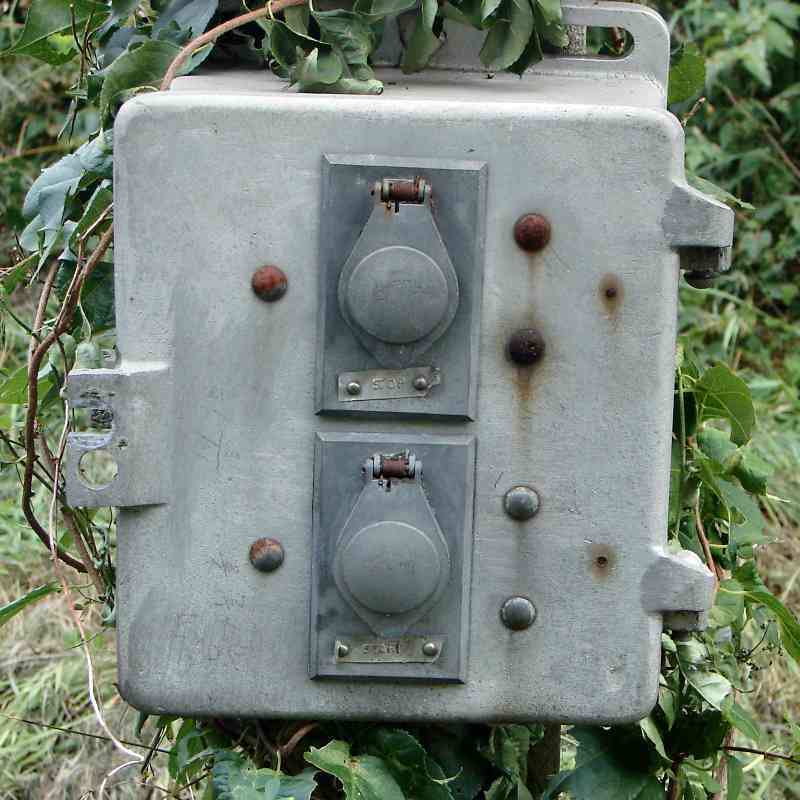 The original bridge had a metal communication wire pole mounted at its center on a concrete pedestal which was part of the bridge structure. Below the pole facing traffic was the letters 'WM' in speed lettering. 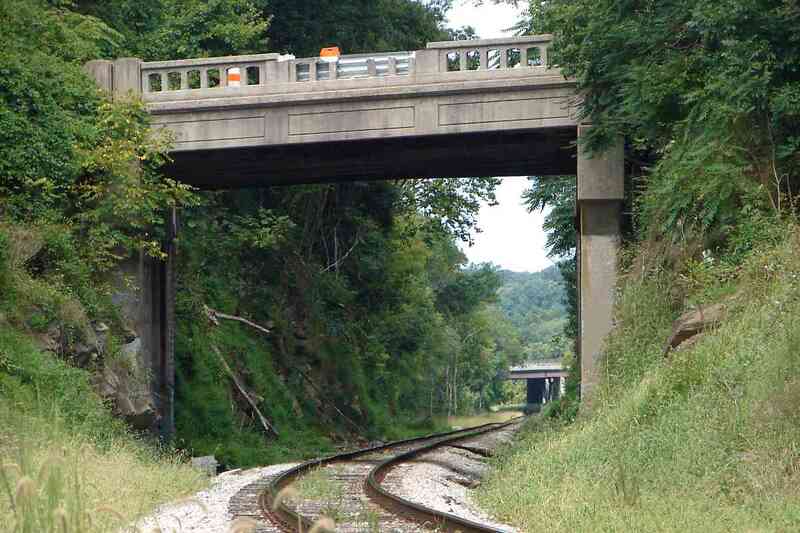 That bridge was completely replaced by the new bridge and installed on a new alignment since the old bridge had to stay in service while the new one was constructed. With future road construction planned, the new bridge was built to be long enough to span the future ramps." That's milepost 11 at the west end of the bridge. Beyond the curve the tracks slide under I-795, the Northwest Expressway. Mount Wilson Lane represents the first grade crossing since Patterson Avenue at mp 8.3. This view looks back to I-795. 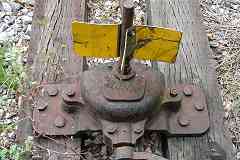 Note more of the WM's modular-style signal support blocks seen earlier in this tour. 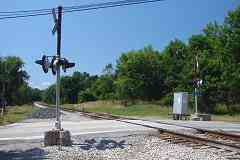 Same grade crossing, opposite view. 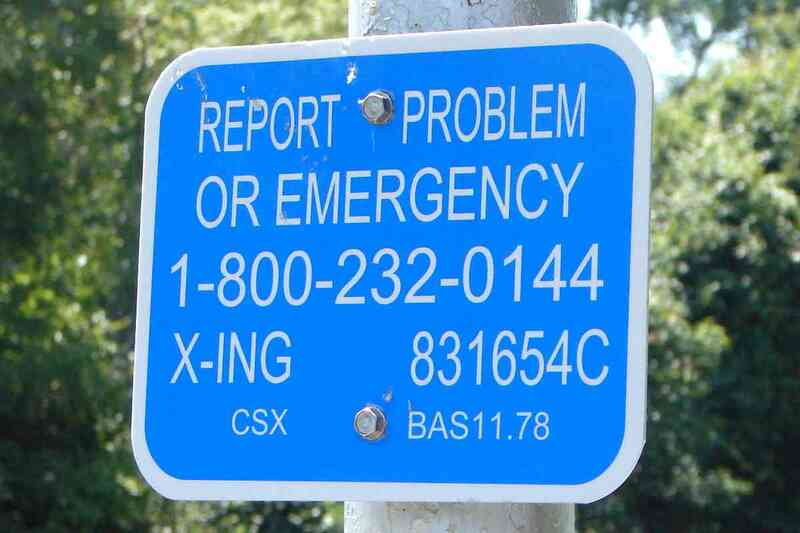 The blue sign tells us, among other facts, the CSX identifier for this route is BAS. From Mt. Wilson Lane, milepost 12 can be glimpsed among leaves on the right, beyond the white pole. 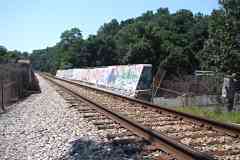 "At Mount Wilson Lane was a siding that crossed the Gywnns Falls to access the heating plant for the Mount Wilson hospital that was on the Hill above. I remember playing on it and exploring the remains of the building when I was a kid. Something may still be there but the overgrowth may be hiding it or Agnes took it all out." 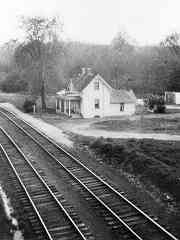 The WM had maintained this as a station for the nearby Mcdonogh School. 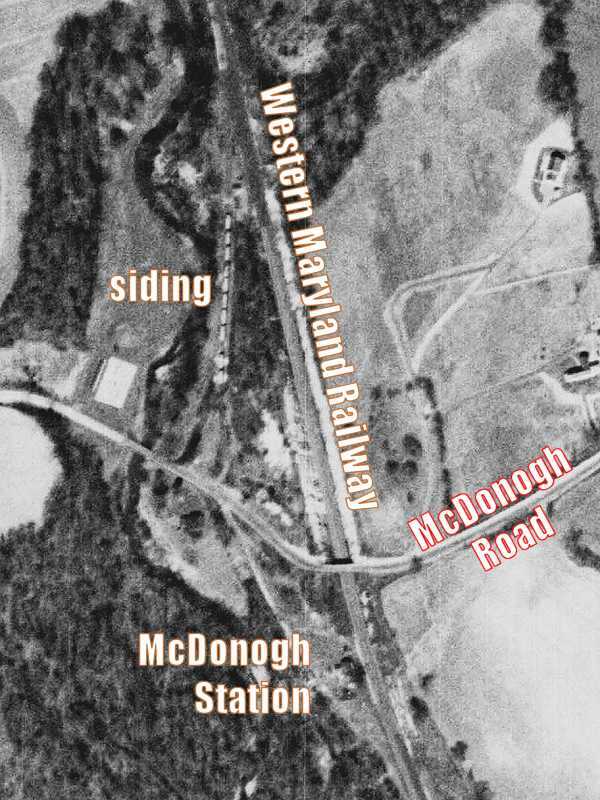 The tracks in this 19th century photo may belong to an original alignment that passed west of McDonogh Station. 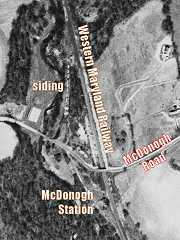 Note the access road to the station is on its left side, a location that would lead to McDonogh Road, the main road in the area. This aerial photo suggests the WM built a new grade-separated alignment for McDonogh Road while the original alignment hung on for awhile as a siding. The new alignment passed on the east side of McDonogh Station. The station was visible from the then-new McDonogh Road bridge. Double track had arrived by this time, and the station has been modified. 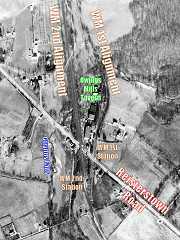 It may have been rotated to face the new alignment: unlike during the 1880s note how the access road now heads to the right. 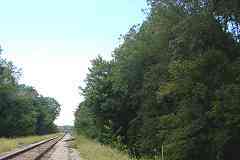 The original alignment appears as a dirt road in the distance. The station is gone, but the original alignment still appears as a dirt road in the distance. Though at first glance the decades-old McDonogh Road bridge looks to be falling apart, only its center guardrail, damaged by a car collision, needs repair. Milepost 13 lurks at distant right while only a hint of a possible original alignment remains on the left. 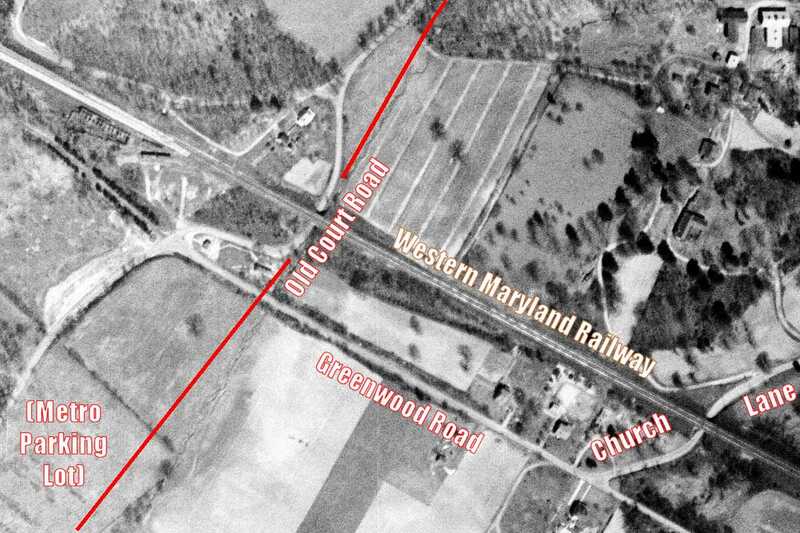 Beyond both I-795 cuts across the scene as the WM curves west, and beyond that until the 1960s track connecting to the Northern Central Railway's (NCRY's) Green Spring Branch had extended straight into the distance. Here's a zoom view back to that curve. 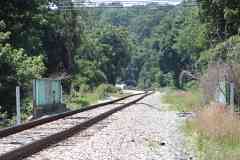 The NCRY had connected in from Green Spring Junction on the left where it had a wye. A map follows below. This is an overlay of a 1927 aerial photo on top of one from 2015. 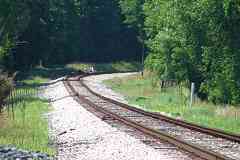 Track north and east of the Western Maryland belonged to the Northern Central Railway's Green Spring Branch. As depicted the NCRY had two connections with the WM, one westbound (off left edge, the 1927 photo didn't quite reach there) and one southbound (railroad east). 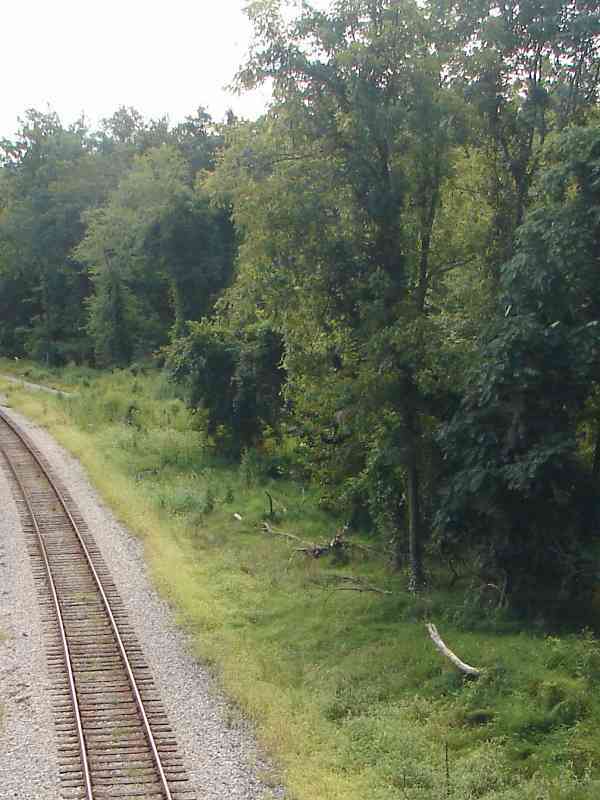 Between those the Y marks the location of Green Spring Junction where the NCRY maintained a wye for the purposes of turning its trains. Now between the letters Y and W one can find big box shopping. The Green Spring Branch's right-of-way has been repurposed into a parking lot access road for that shopping. 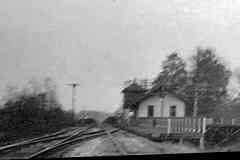 About 1910 where the NCRY and WM met the latter relocated its station from Green Spring Junction to this spot, named Kirk. 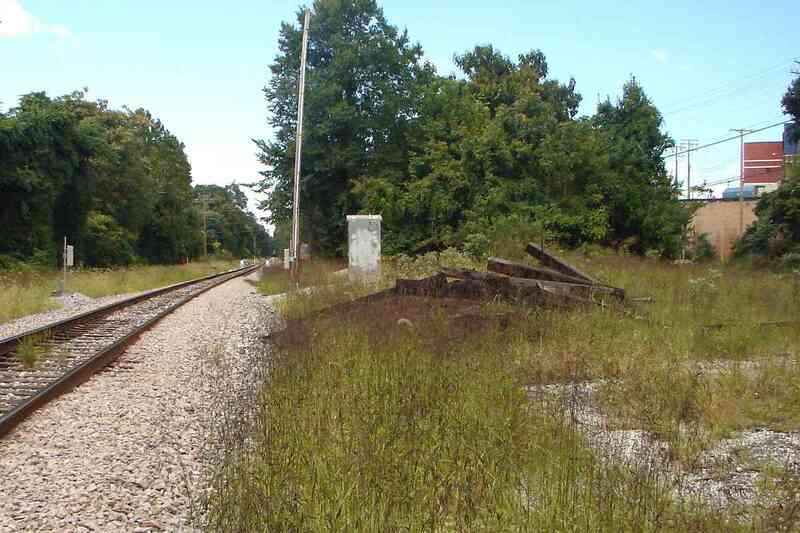 Note the dual platforms, this side for the WM, that on the right for the NCRY. While Baltimore's B&P tunnel was getting a makeover from 1916 to 1917 the WM accessed the city by rerouting its trains via the NCRY's Green Spring Branch. Kirk has been subsumed into the likes of Garrison, leaving ADC and Google maps to wonder where the town had been. The station site is behind the St. Thomas Shopping Center that is unseen on the right. The WM's relocation of its station to Kirk precipitated a complaint to the Public Service Commission by a local landowner who wanted the station kept on her land. Nothing clearly identifiable from the station, the building, platform, water tank, etc. survives, though one can find a few pieces of wood and siding material scattered among regrowing trees. The track adjacent to the passenger platform remains, albeit disused, along with a rusty Bethlehem Steel New Century Adjustable switch stand dated 1956. Online there were no closeup photos of this particular switch stand model, none I could find quickly anyhow... voila, another world crisis solved. The NCRY and WM linked just northwest of Kirk Station at this spot. In fact the rightmost rusty rail is a remnant of the NCRY's Green Spring Branch. 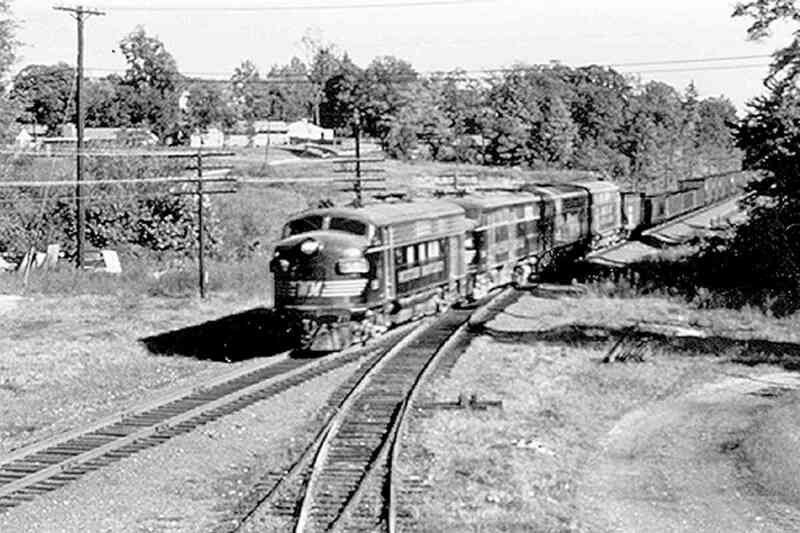 It last hosted a train during the 1950s. The Green Spring Branch originated as part of the Baltimore & Susquehanna Railroad's intended route to Gettysburg, Pennsylvania. In 1832, when most cities big and small lacked rail transport, the B&S got as far as Owings Mills via the alignment ahead, making this stretch some of the world's oldest railroad right-of-way still in use. The WM's bridge over Painters Mill Road has been spiffed up for the opening of yet another shopping center adjacent at left. Note for oncoming traffic the horizontally-mounted signals, an orientation uncommon in this region but necessitated by the visibility-reducing bridge. 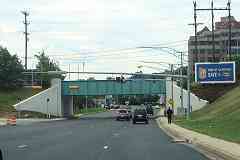 Owings Mills Boulevard has been growing in fits and starts for decades, destined to one day become part of US 29. 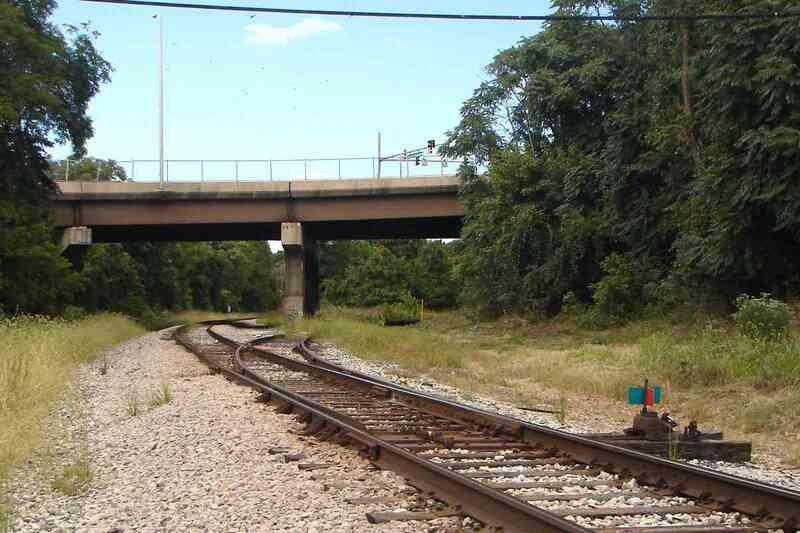 Here it spans both the original (right) and current (left) railroad alignments through Owings Mills. 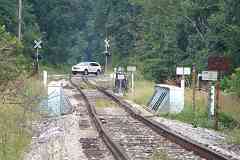 First we'll follow the WM's original alignment then return here. 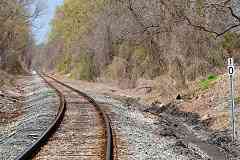 The Baltimore & Susquehanna's hopes of reaching Gettysburg, Pennsylvania faded as it changed focus to other locations. 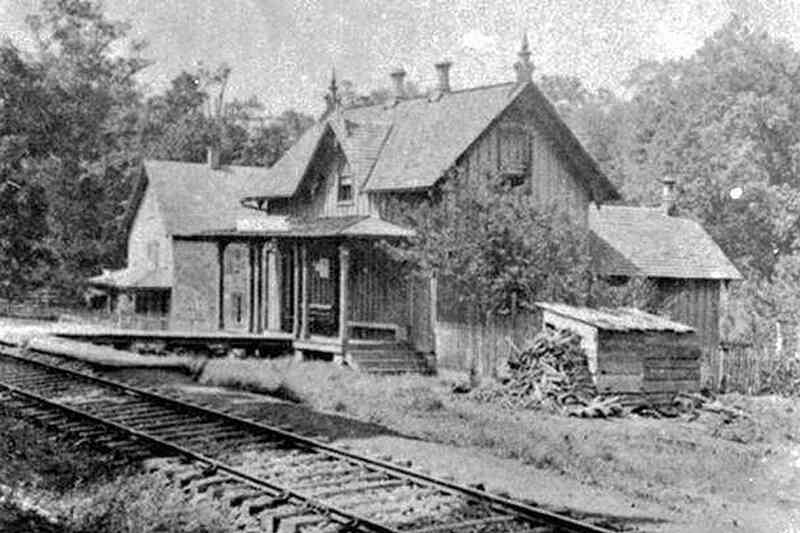 In 1857 before merging into the Northern Central Railroad the B&S sold to the fledgling Western Maryland the stretch from Green Spring Junction to its terminal at Owings Mills Tavern. 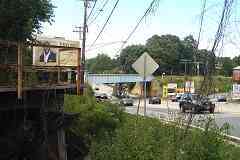 This view looks along that route and across Reisterstown Road. 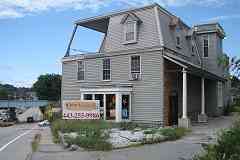 The tavern was a distrance beyond the large building at photo left. 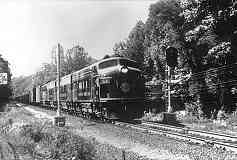 Next the WM built from Green Spring Junction into Baltimore along the route this tour has been following. During the 19th century Reisterstown Road was quiet enough that a grade crossing sufficed. 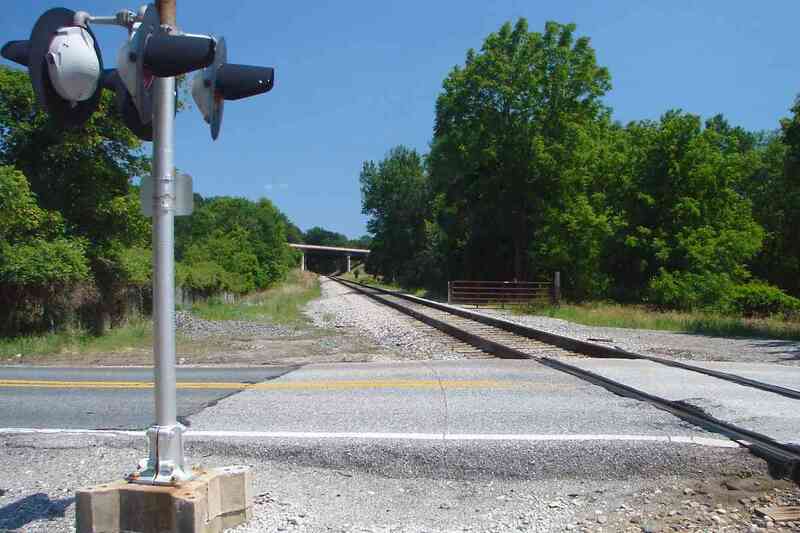 Grade separation via a parallel alignment would wait until 1906, at which time this original route was relegated to infrequent freight service that continued into the 1970s. When a train needed to cross Reisterstown Road (MD 140) it could lower and raise warning gates via a trackside control panel that still exists, as seen at right. 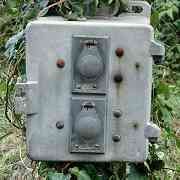 The buttons are labelled Stop and Start. 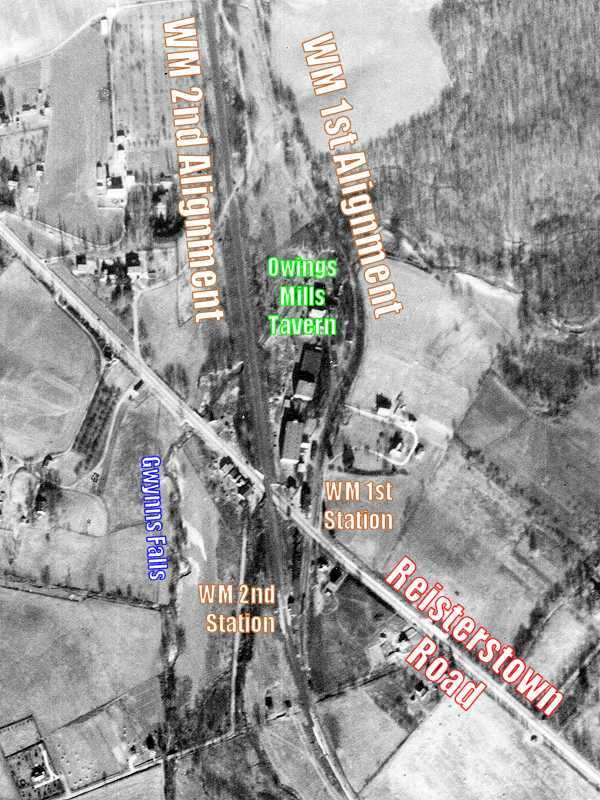 Owings Mills Tavern was situated off the main drag, so the WM constructed its own station visible from Reisterstown Road. That station survives, renovated around 2003, odd roofline and all, and at photo time gave home to Wine & Canvas. 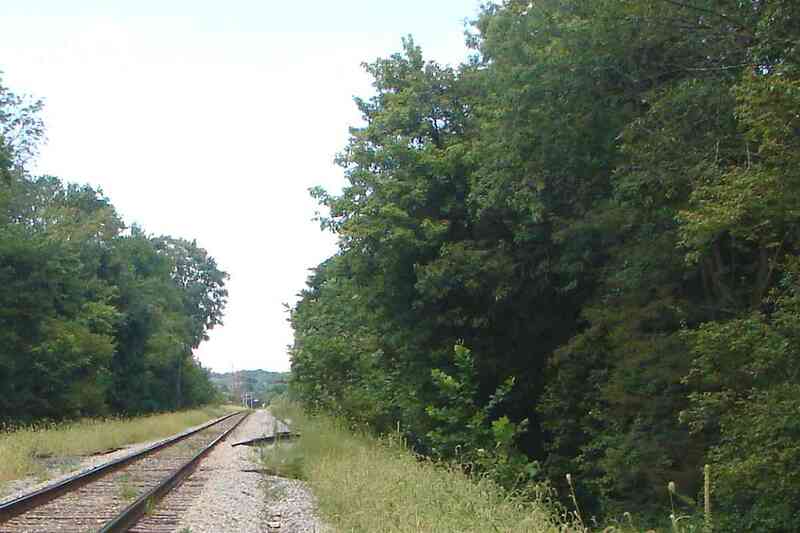 Though not visible in this view, rusty rails can be found off to the right. 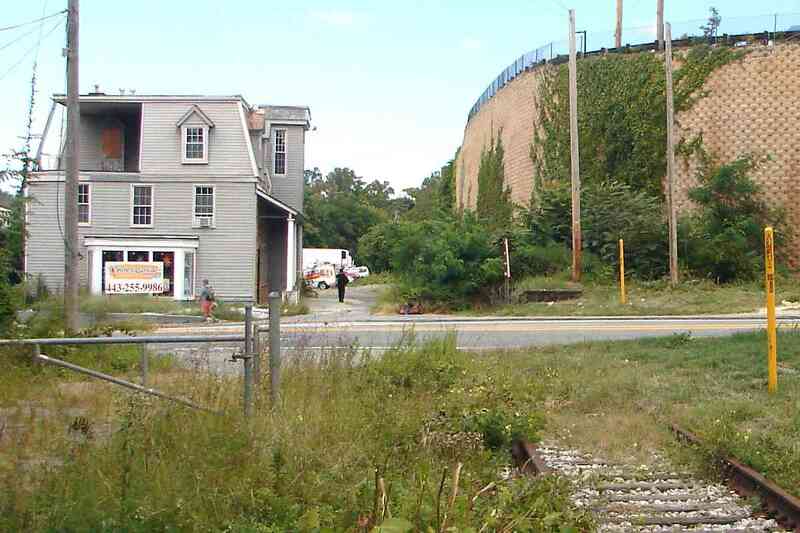 In the foreground some of that ex-WM trackage curves behind the old station (distance). The Owings Mills Tavern had been located off photo edge right. 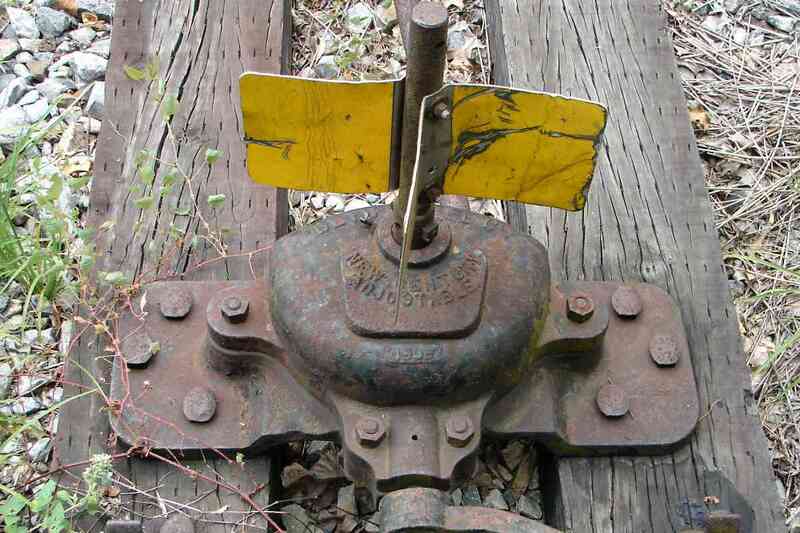 The WM's first alignment was acquired from the Baltimore & Susquehanna Railroad. At the time of this photo, Reisterstown Road was part of US 140, the main road between Baltimore and Gettysburg, Pennsylvania. 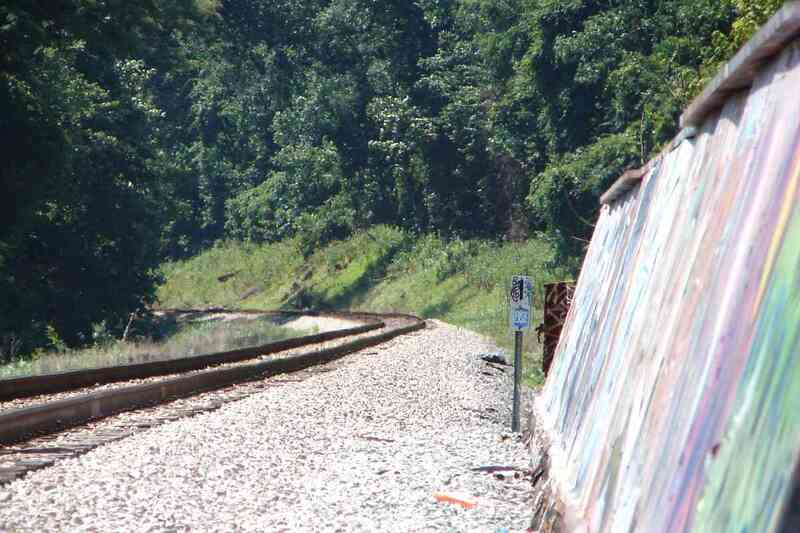 This Gywnns Falls is the same waterway spanned downstream by the B&O's Carrollton Viaduct. 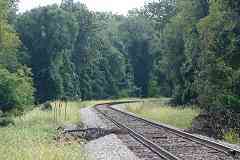 The WM will follow it upstream to its headwater in Glyndon, Maryland. 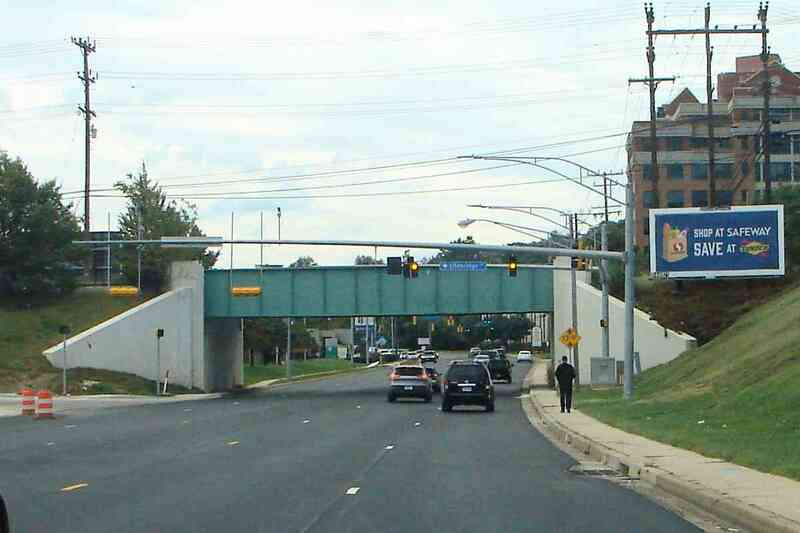 We have returned to Owings Mills Boulevard, which is behind the photographer. 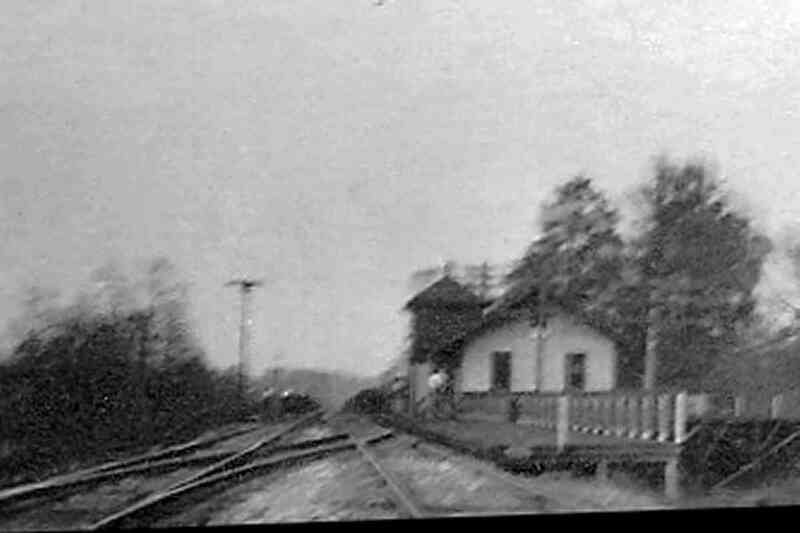 If not for the trees at center, the WM station shown in the prior photos would be visible. 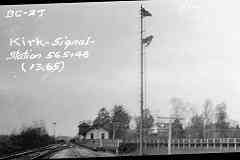 When in 1906 the WM constructed a grade separation at Reisterstown Road it built a new station too. 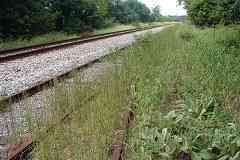 That station, which had been situated just beyond this pile of ties, can be seen in photos linked below. 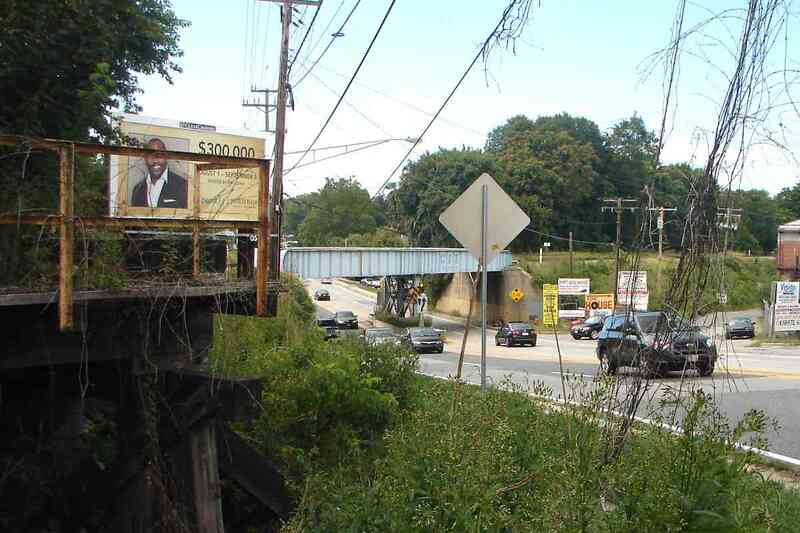 A zoom view past the station site shows the bridge over Reisterstown Road, followed by yet another bridge over Gwynns Falls, then a car at the Groff Lane grade crossing near milepost 15. 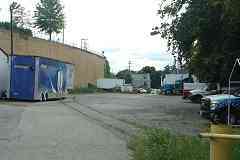 Closer and off photo edge right is a disused WM loading dock. The now-deteriorating 300-foot long dock (left) extends to Reisterstown Road and permitted unloading of bulk goods via gravity to trucks waiting below. 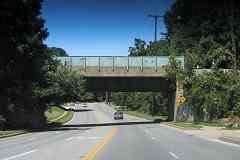 The WM's bridge over Reisterstown Road is beyond. 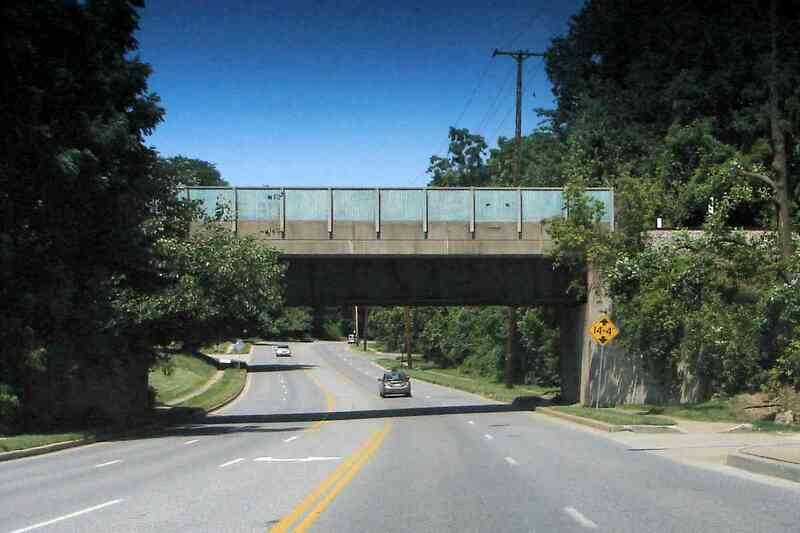 Grade separation came to Reisterstown Road with this bridge in 1906, built long enough to allow for more than a century worth of subsequent automobile and population growth. The vehicles are fancier and the railroad name different, but otherwise many decades later things look surprisingly similar. The ex-WM / CSX Hanover Subdivision tour ends here, thanks for riding along! If you'd like to continue west, visit Jeremy's site. For a general WM overview, see American Rails.